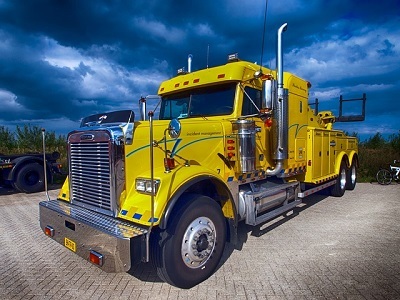 Every profession has its slang, but trucker lingo has a long history of colorful, and sometimes racy, language for the sights and sounds of the American highway system. On the road, truckers communicate with citizens band (CB) radios to warn each other of hazards and to pass the time on long drives. Here are some of the terms you might hear if you tuned in. Advertising: A police car that is flashing its emergency lights. Alligator: A large piece of blown tire on the road. Alligators can “bite” truckers and other drivers on the road by bouncing up into hoses, fuel crossover lines, belts, and smaller vehicles’ tires or windshields. Barefoot: A truck that is crossing a mountain pass without any additional traction devices. Bean Popper: Someone who is taking a lot of pills (possibly illegal ones). Bear: A law enforcement officer. Bear Bait: A speeding passenger vehicle that “protects” other speeding vehicles behind it by being more likely to get pulled over and ticketed. Bear Bait: A speeding driver or a driver behaving erratically on the road. Someone the police will try to pull over. Bear Bite: A ticket for speeding. Bear in the Air: A police aircraft looking for traffic violations. Bear in the Bushes: A hidden law enforcement officer with a radar gun. Beat the Bushes: Driving ahead of other truckers to try to lure police away from them. Black Eye: A broken headlight. Blinders: High beams, not supposed to be used when oncoming drivers may be blinded by the bright light. Bobtail: Driving a truck without a trailer attached. Many drivers do not get paid to drive without a load. This means that they will sometimes not count the hours that they were driving with a “bobtail” towards the total time they have been on the road in their logbooks. Box: A linear amplifier used to boost a CB transmitter’s power above the maximum limits allowed by the Federal Communications Commission. Brake Check: A traffic slow-down or stop up ahead which will require the truck driver to brake well in advance of other cars in order to stop in time. Brown Paper Bag: An unmarked police car. Brush Your Teeth and Comb Your Hair: Be aware that the there is a radar gun ahead (many radar guns take pictures of speeding drivers, so this is what someone would do if they planned on having their picture taken). Bumper Sticker: A tailgating vehicle. Bundled Out: A truck that is at maximum capacity and is very heavy. Bunny Hopper: A vehicle that frequently changes lanes. Care Bear: A police car with a construction zone, “caring” for the construction workers. Catch Car: A police car parked after a radar set-up so that law enforcement officials can pursue speeding drivers. Checking Your Eyes for Pinholes: Being tired. Checkpoint Charlie: A drunk driving checkpoint set up by police that looks like a roadblock. This term is less common, since younger drivers are not old enough to remember the original source of the phrase. Chicken Lights: Extra lights on a truck’s exterior. Christmas Card: A ticket for speeding. Citizen: A person who is not a trucker or a police officer. Clean Shot: A road free of obstructions, construction, or police officers. Cocaine Cowboy: DEA officials looking for illegal narcotics. Come-a-part Engine: A Cummins engine. Comedian: The median between lanes of a divided highway. Comic Book: The log book in which truckers record their hours worked and other details about their trips (called “comic” because the information in it is often falsified to make it look like the trucker is complying with regulations). Convoy: A group of three or more truckers travelling together, often in a line. Covered Wagon: A flatbed trailer with sidewalls and a tarp instead of a roof. Often hauling gravel or steel rolls. Crack ‘em Up: A term for a semi-truck accident. Dead head: Hauling an empty truck. Many drivers do not get paid to drive without a load. This means that they will sometimes not count the hours that they were driving with a “dead head” towards the total time they have been on the road in their logbooks. Dead Pedal: A truck or car that is moving slowly. Decoy: A police car without an occupant, sometimes left near the road to enforce good driving behavior or because the officer is elsewhere. Destruction Zone: A construction zone. Diesel Cop: An officer working with the Department of Transit’s Commercial Vehicle Enforcement division. Dirty Side: The East Coast of the United States. Doing Our Thing In the Lefthand Lane: Traveling at full speed in the passing lane. Driving award: A ticket for speeding. Dream Weaver: A tired driver who is weaving between lanes or within a lane while traveling on the road. Draggin’ Wagon: A tow truck or wrecker. Dragonfly: A truck with no power or not enough power. So called because it “drags” up hills and “flies” down hills. Dropped It Off the Shoulder: To run a vehicle off the side (shoulder) of a highway. Eaten By A Bear: Arrested by the police. Fat Load: An overweight load. Feeding the Bears: Paying a fine on a ticket or citation. Flip-flop: A return trip or a U-turn. Foot Warmer: A linear amplifier used to boost a CB transmitter’s power above the maximum limits allowed by the Federal Communications Commission. Four Wheeler: Any vehicle on the road that is not a truck (as in, it has only four wheels). Four Wheel Phone Booth: Someone who is talking on their cell phone while driving. Front Door: The first vehicle in line in a convoy. The driver of this trucks is supposed to warn the following trucks about “bears,” or police officers. Full Bore: A truck traveling at full speed. Garbage Hauler: A truck hauling produce or a load of produce. Gear Jammer: Someone who frequently speeds up and slows down while driving. Gear Slammer: A truck driver who is accelerating and decelerating quickly or speeding. Georgia Overdrive: A dangerous driving maneuver in which the transmission is put into neutral on a downgrade, allowing the truck to go extremely fast. Granny Lane: The right-side lane on a multi-lane highway or interstate, where traffic will be going slower. Grass: The median strip on a divided highway. Greasy: A slippery or icy road. Greasy Side Up: A vehicle that has flipped over. Gumball Machine: A patrol car’s lights. Hairpin: A sharp curve in the road. Trucks can tip over on these if they are traveling too fast for conditions. Hammer Down: Going fast, stepping on the accelerator. Hammer Lane: The left-side lane on a multi-lane highway or interstate, where cars will be going faster. Handle: A unique name used on the radio to identify a speaker. Truckers choose their own handles. Harvey Wallbanger: A driver who is driving recklessly or appears to be drunk. Hauling Fence Post Holes: Hauling an empty truck. Many drivers do not get paid to drive without a load. This means that they will sometimes not count the hours that they were driving an empty truck towards the total time they have been on the road in their logbooks. Hauling Sailboat Fuel: Hauling an empty truck. Many drivers do not get paid to drive without a load. This means that they will sometimes not count the hours that they were driving an empty truck towards the total time they have been on the road in their logbooks. Hauling Dispatcher Brains: Hauling an empty truck. Many drivers do not get paid to drive without a load. This means that they will sometimes not count the hours that they were driving an empty truck towards the total time they have been on the road in their logbooks. Having Shutter Trouble: Trouble staying awake, often while on the road. Hole in the Wall: A tunnel. Hood Ornament: A car that passes a truck at high speed, returns to the truck’s lane, and slows down too quickly (trucks cannot slow down as quickly as passenger cars). Hundred Dollar Lane: The far left lane in highly populated areas. Truckers may face a hefty fine for driving in these lanes. Hundred Mile Coffee: Extremely strong coffee. Ice-Capading: Losing traction on the road during icy conditions. Invitation: A traffic ticket or citation. Jet Pilot: A speeding vehicle. Jewelry: Cables or chains on tires. Joke Book: The log book in which truckers record their hours worked and other details about their trips (called “jokes” because the information in it is often falsified to make it look like the trucker is complying with regulations). Keep It Between the Ditches: Have a safe trip. Keep the Shiny Side Up: Have a safe trip. The top of the truck is the “shiny” side, while the bottom is the “greasy” side. Kiddy Car: A school bus. Lag Time: The delay between the moment the brakes are pressed and the moment when the air in the braking system in the tractor reaches the trailer brakes. Land Yacht: A camper or mobile home. Lane Flipper: Someone who is repeatedly changing lanes. Large Car: A fancy truck with a big sleeper, customized paint, and lots of horsepower. Left Coast: The West Coast of the United States. Little White Pills: Stimulants used to stay awake on the road during long hauls. May refer to illegal substances; can also be used ironically to refer to legally used coffee or caffeine pills. Loot Limo: An armored car. Magic Mile: The last mile of a trip. Mash Your Motor: Go fast, step on the accelerator. Motion Lotion: Fuel for a truck. Nightcrawlers: Police officers, especially when there are many in the areas. Office on Wheels: Someone spotted on the road using their car to do office work, such as using a laptop while in traffic. Organ donor: A civilian motorcyclist driving erratically or without a helmet. Paper Hanger: A police officer giving out speeding tickets. Parking Lot: An automobile transporter. Usually called this when the trailer has no cars on it. Parking Lot: A traffic jam. Piggy Back: One truck towing another truck. Plain Wrapper: An unmarked law enforcement car or truck. Polar Bear: An unmarked white police car. Portable Barnyard: A truck that is hauling livestock. Professional Tourist: A trucker (a joke, since truckers aren’t tourists but they travel the country like tourists). Raking the Leaves: The last person in a multi-truck convoy. This person is tasked with watching for police cars coming from behind. Rambo: A person who talks aggressively or acts tough on the radio. Reading the Mail: Listening to the radio without talking. Re-Power: One truck taking the load from another. This may happen if the original truck breaks down or the first driver has run out of hours and the load needs to be transported without stops. Rig: A truck, or the truck and the trailer. Rifle Barrel: A round bulk liquid trailer with no internal baffles to break up the sloshing of liquid while in transit. These can be dangerous, as the weight of the sloshing liquid can unbalance the trailer and cause it to tip over. Road Pizza: dead animals in the road or on the side of the road. Rocking Chair: A truck traveling in the middle of two other trucks in a convoy. This truck is less likely to be ticketed for speeding by police officers. Rolling Roadblock: A construction vehicle ahead that is moving at a slow speed. Rollover: A wreck in which the rig or the truck and rig turn over. Rubbernecker: Careless drivers who cause slowdowns at accident scenes by turning their heads to look at the accident rather than watching the road. Running on Rags: Driving a truck with little or no tread on the tires. Sandbox: An escape ramp off to the side of the road that large vehicles can pull off on to stop. These are often made of sand. Schneider Eggs: Orange barrels filled with sand that serve as a protective barrier at construction sites. The Schneider trucking company is known for its orange trucks, so these look like “eggs” laid by Schneider trucks. Seat Cover: The drivers or passengers of smaller four-wheel cars. Shaky Side: The West Coast of the United States (named for its more frequent earthquakes). Shiny Side Up: A vehicle that has not flipped over after an accident. Shooting You In the Back: A law enforcement officer is using a radar gun to read your speed after you passed them. Show Off Lane: The left-hand passing lane. Shutdown: Put out of service by the Department of Transportation due to a violation of safety protocols. Smoking the Brakes: The brakes of the trailer are smoking from overuse. This can happen while going downhill on a steep grade. Someone Spilled Honey On the Road: Police, usually state troopers, are everywhere. Stand On It: Accelerate quickly. 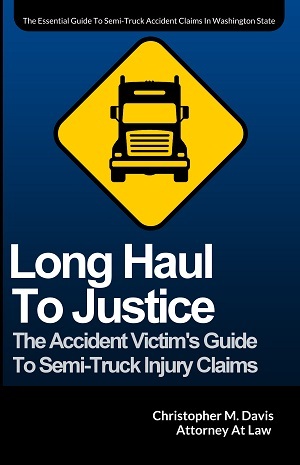 Swindle Sheet: A truck driver’s log book. Swinging: Carrying beef carcasses (these “swing” from hooks inside a refrigerated truck). Tandems: A trailer’s rear wheels. Team Drivers: A truck in which two drivers switch off between driving and sleeping in the back. This allows the truck to travel much faster between two points, since both drivers are still getting their legally required amount of rest. Ten-thirty three: An emergency situation. Thermos Bottle: A tanker trailer. Throwing Iron: Putting on tire chains. Too Many Eggs in the Basket: A load that is over the gross allowed weight. Triple Digits: Traveling at over 100 miles per hour. Triple Digit Ride: A truck that has enough horsepower to travel at over 100 miles per hour. Turtle Race: A zone with a speed limit under 45 miles per hour. Twister Tracker: A storm chaser or tornado chaser (these vans are often heavily armored or reinforced to protect their occupants during severe weather). Two Miles of Ditches For Every Mile of Road: Drive safely (the “ditches” are off to either side of the road, so a truck that passes both ditches without going in has stayed on the road). West Coast Turnarounds: Uppers, such as Benzedrine or speed. The slang term comes from the (extremely illegal) idea of a driver going from the East Coast of the United States to the West Coast and back again without sleeping. White Stuff: Snow. Can cause dangerous trucking conditions if low temperatures result in ice in the road or poor visibility. Wiggle Wagon: Double or triple trailers being hauled by a single truck (named because these “wiggle” behind the truck on the road). With a Customer: A police officer who has pulled a car over. Widowmaker: Double or triple trailers being hauled by a single truck (named for the fact that these arrangements cause more fatalities than single trailers). Zipper: The dashed lane divider. flatbed trailer with sidewalls and a tarp instead of a roof. Often hauling gravel or steel rolls flip flop.